Avon Napoleonic Fellowship: It's what the Royal Marines are for! It's what the Royal Marines are for! As readers of previous posts on this blog may recall, I have been on a personal journey to try to find a set of Napoleonic naval rules that will work as an equivalent to Shako for land rules. The ANF wants to be able to stage a major naval encounter with dozens of ships a side over a weekend, with realistic results but without endless calculations slowing down play, whether for complex sailing manoeuvres or firing. Efforts in the past to use Signal Close Action, Form Line of Battle and Heart of Oak did not meet favour either with my colleagues, or indeed really with me. After extensive searching and reading up on rules, I decided to try this set. I have used other rule sets from A&A Game Engineering in the past, and on first testing them out myself, I was optimistic. But how would they work in a multiplayer game? We decided to try them out with the simplest possible encounter, two ships a side. 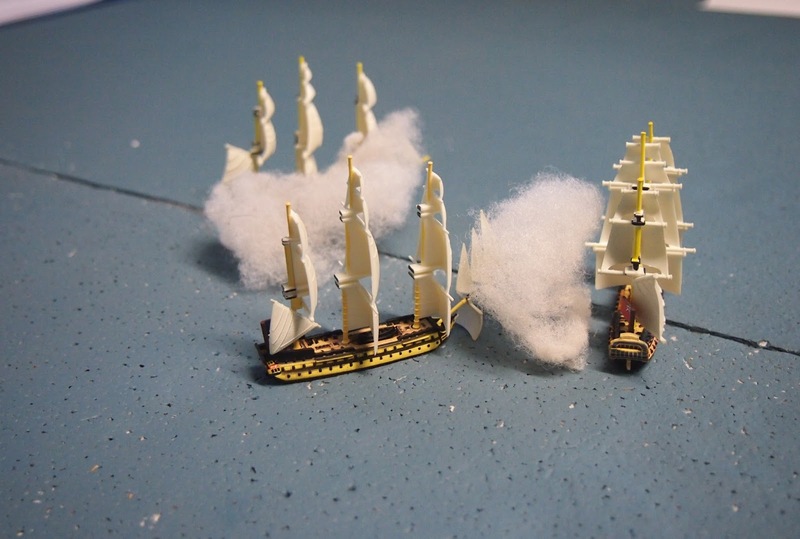 For the British, I picked a 'long-74', HMS Invincible, and an old '74, HMS Bellerophon, whilst for the French, the new issue '80 Bucentaure got a first outing, along with the elegant '74, Commerce de Bordeaux. To make matters simple for this first test of the rules, all crew and command levels were set to 'average' and the wind direction, here coming from the starboard beam of the French squadron, was fixed for the encounter. It was good to see that all could be varied, however, in a simple and intuitive way. The two squadrons approach one another; French nearest, Bucentaure leading. The shot doesn't show the nicely moulded difference between the '80 and the '74. 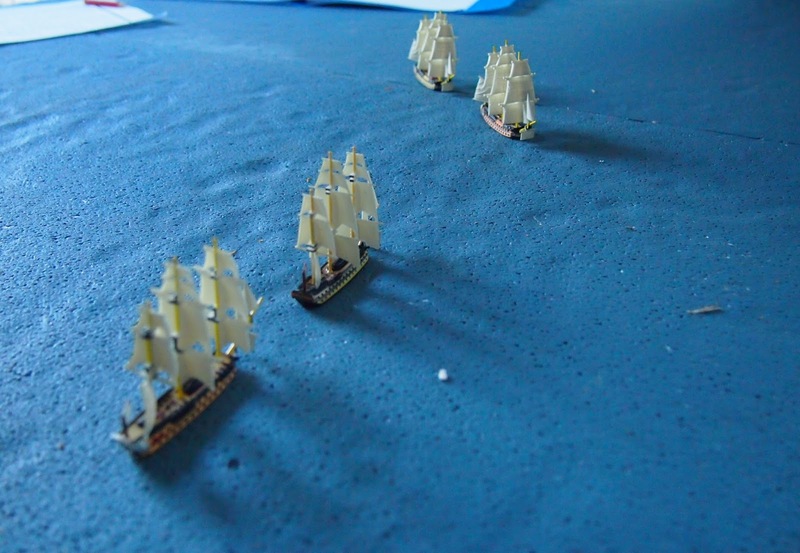 I am a great fan of the Sails of Glory ships from Ares (though not the rules). Ten minutes (one move) later. The French may have been aiming to cross the British 'T', but they underestimated the tactical flexibility of their foe, which split and fired a broadside from both ships into the Bucentaure. First blood to the British. Both firing and damage recording was sorted in minutes: each ship has a gunnery, speed, hull and crew rating which are adversely affected by enemy fire - and that's it. Of course the French reply, with significant damage being inflicted on HMS Invincible. 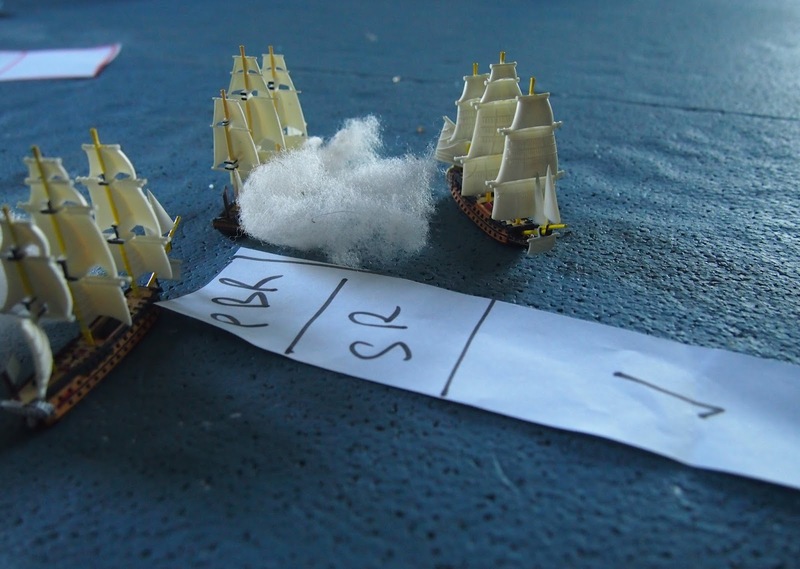 In this small encounter, each ship was finding its own opponent. The rules have three ranges: normal, short and point-blank, which operate as modifiers to fire factors, exactly as one would expect. Within a short space of time the fight was within short range, and the chance of damage was being increased. Initiative in the rules is a simple die roll, then alternating player squadron by squadron, but with only one squadron, the effect can be that one side gets to fire twice without the other side being able to respond. This is what happened, as the French were able to get Bucentaure into a position to stern rake HMS Invincible. 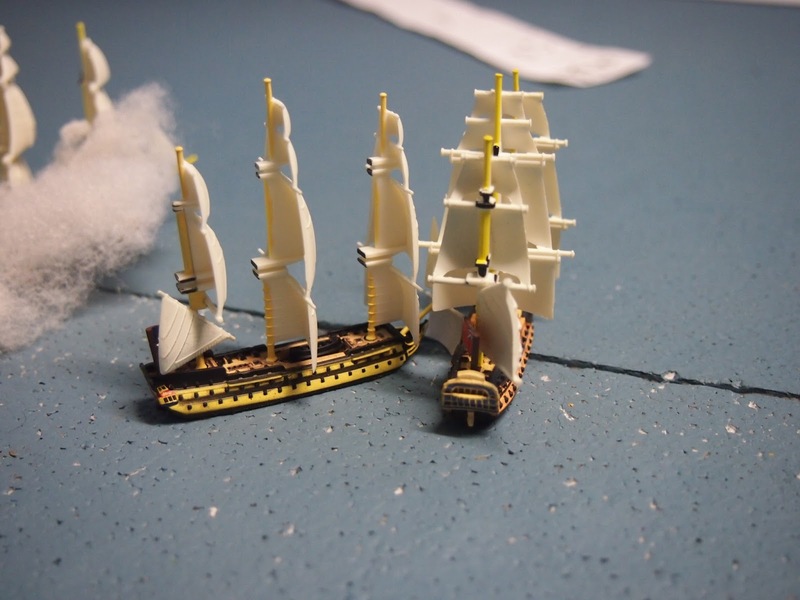 The rules are not meant for just one squadron: for small actions the solution is probably simply to make each ship a squadron, which in this action would reduce the chance of this eventuality to 1/16 as opposed to 1/2, or to revert to simple alternate movement. 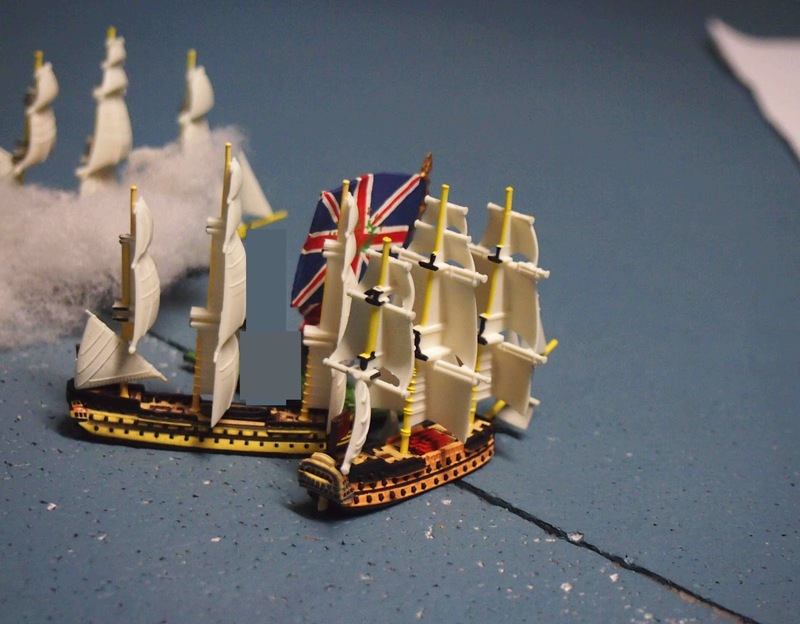 The British then took the opportunity to close to broadside - easy enough, as the wind is coming from the left-hand side of the pictures. The sailing rules allow for a 'dead zone' through which a tack is required, for turning, acceleration, maximum speeds (which requires a little juggling when ships move through several maximum speeds in a single move, but it is not difficult to organise) - but above all, they are simple to use. 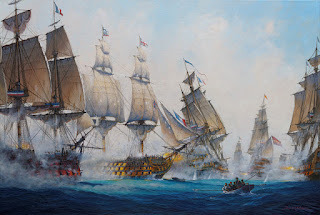 Now the tables were turned, with the British getting two moved, and Bucentaure started to feel the heat, being raked in its turn as well as fired upon on the broadside. 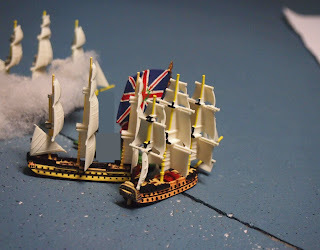 The decision was made to try a boarding action, partly because the Bucentaure was down to one hull point (as was HMS Invincible) but also to try out the boarding rules. But all did not go to plan. The French attempt to board was repulsed, whilst the British commander decided on a counter-boarding action. After four hard-fought melees (all of which the rules say take place in one turn of 10 minutes - I am researching whether this is plausible or whether we should have only 2 melee rolls per move), the French capitulated, with the Union Flag being raised on the deck of the Bucentaure. Well, said our allegedly land-lubber British commander, it's what the Royal Marines are for. The action came to a natural end at this point. The Commerce de Bordeaux is out of this shot, making away and out of range of the British. 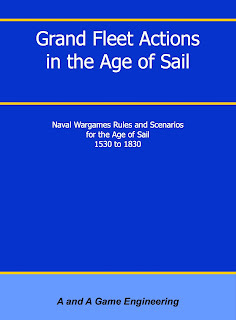 All parties expressed themselves pleased with the rules, and confident that the couple of hours we spent on this action strongly indicated that they would work well for a large fleet action, exactly as the authors intended. The simplicity of the mechanics did not detract from the logic or the enjoyment of the action - far from it, both players understood them quickly, and were able to concentrate on decisions, on fighting the battle itself. 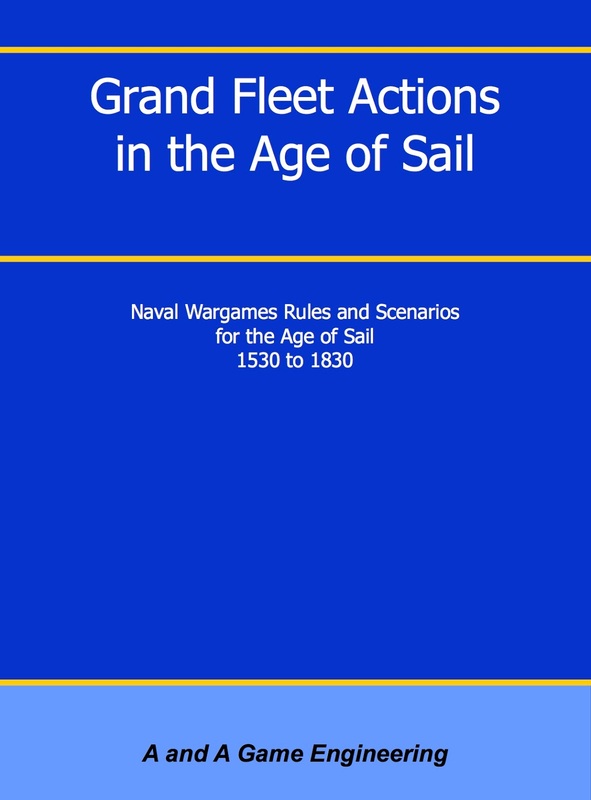 For myself, I believe my long and at times depressing, not to say embarrassing, quest for the ideal set of Napoleonic naval rules for the ANF is now finally over. Many thanks to my colleagues for putting up with it - and to James for the pictures for this blog post. We can now look forward to a major naval action with some confidence at last. I too have shared the long hunt for rules capable of handling battles of several squadrons without tasking a weekend and one player for each ship to resolve. I look forward to reading of your first large scale battle with these rules! Yes, I noted that from one of your previous observations. I am pretty confident that these rules are what is actually required. I always judge a rule set by whether I can not only remember the mechanics, but explain them to someone else, both of which I can certainly do in this case. The rules are available through Wargames Vault at a very reasonable price - I should be most interested should you follow through with a similar trial of your own, especially as you say at multiple-squadron level. An engaging write-up of what turned out to be a most satisfying play-test. Well done Julian. As you said in the post, damage is sensibly and simply recorded. 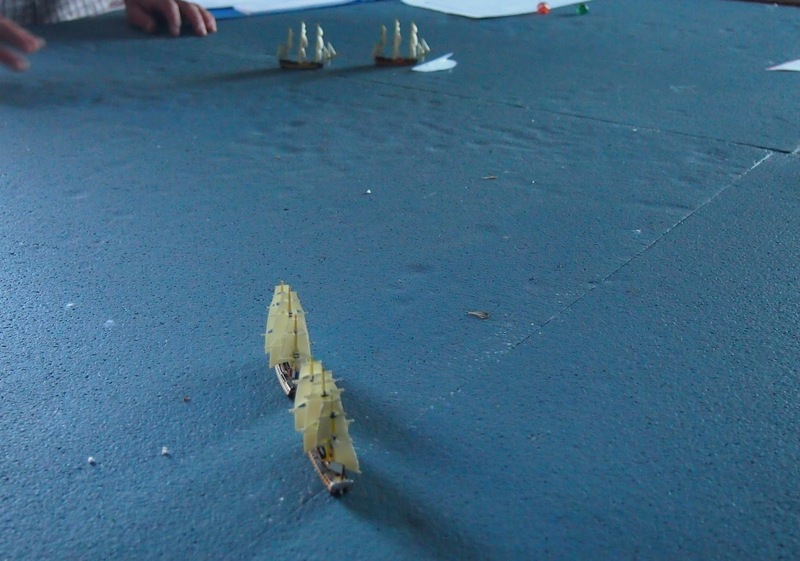 At ten minutes a turn, one is not bothering to record broadsides being fired (how simple and clever is that?!). 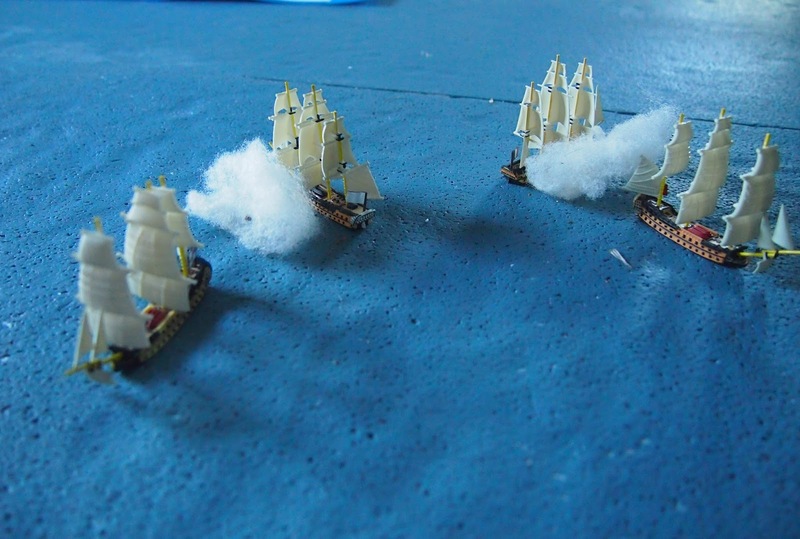 As ships take damage their effectiveness and manoeuvrability is reduced. 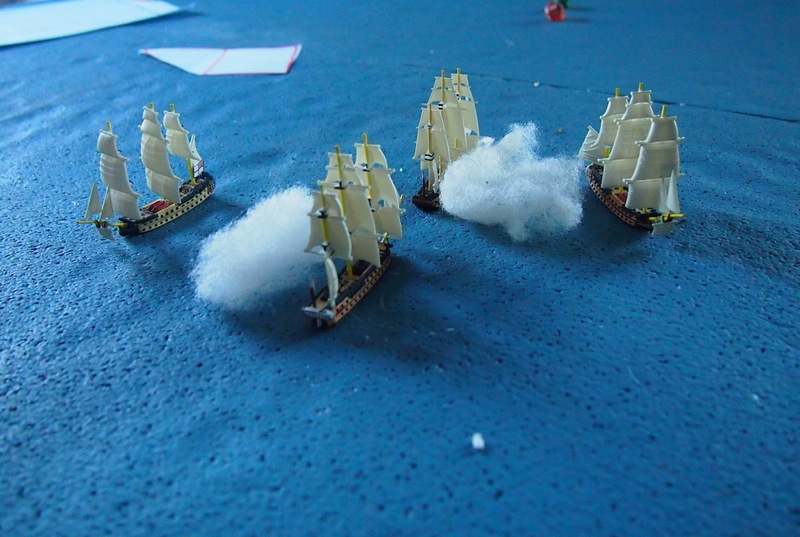 The battle gets 'messier' as the ships manoeuvre and counter-manoeuvre. It will be good to see the impact of this on command when we try them with more ships. A large-scale test will really put the rules through their paces. I look forward to our re-match of Glorious First of June/Combat de Prairial! Very interesting lads as I think most Wargamers of this period that I have encountered have all been in the same...um...boat! Love Napoleonics, would love to play some naval rules but my lack of meteorological skills and qualifications prevent me from sailing well enough in every set of rules I’ve tried! Very interested in looking at these rules myself now. Thanks for the report and review. Thanks Carlo. With these rules, those sorts of skills are just not needed. 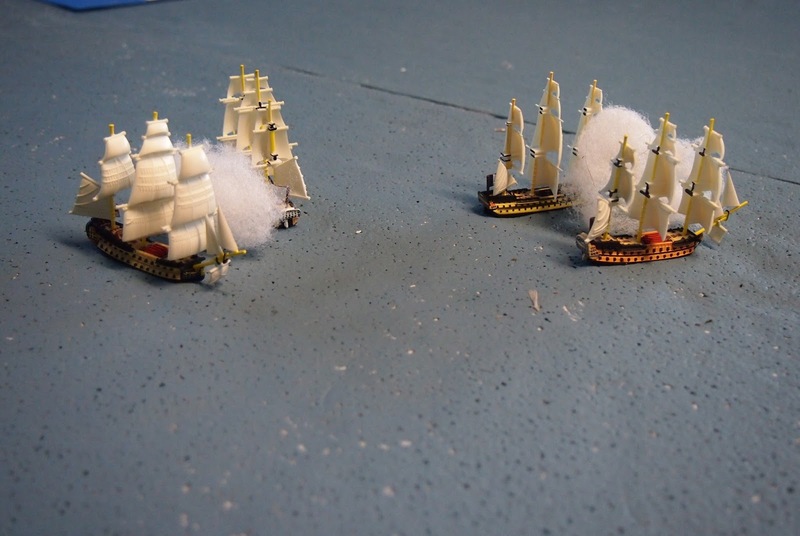 Sailing is straightforward - so is shooting - but there is plenty of opportunity for tactics, such as the British employed successfully right from the start in this battle. Getting multiple broadsides into one enemy ship is a Seriously Good Idea with these rules, as it should be. Thanks James. We will have to decide exactly how to deal with squadron initiative before we do, and check those boarding action times, but generally, I'm confident. Command and control is at the heart of GFA, too, so in a sense we haven't really yet had the opportunity to see them at their best in a larger action. That said, I think it would be great to use GFA for an evening's club wargame anywhere - pretty well guaranteed one would finish, and no reason not to think one would have a plausible outcome. 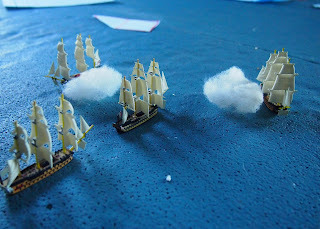 I suspect the rules work better for Napoleonic than WSS/Anglo-Dutch fighting, but I have yet to try out General-at-Sea for them so I shall reserve judgement. "Found" this post through a Tango01 post on TMP. I'm encouraged by your review of the rules. I also have been looking for an easy to play set of sailing navy rules to use with the large number of plastic "Pirates of the Caribbean" line of ships I've accumulated. Looking forward to your fleet action testing. Jim, we'll probably do another multi-squadron action test - using slightly more aspects of the rules than we permitted ourselves for this encounter - in the next few months before opening up to a full historical action, and I will post it as soon as done. I'm sure the rules would work with Pirates, or any other sizeable group of ships. Good progress. Meanwhile, further west, we are trying out "It's Warm Work" although in a smaller scale. 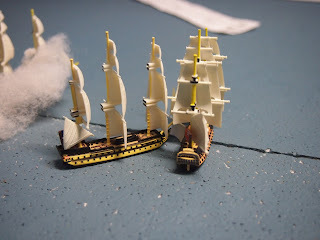 I just wish I could pick up some cheap Sails of Glory ships. Have you seen the Signal Close Action rules? Especially the fast play version for larger actions? Yes, we tried SCN on the first occasion we fought a Napoleonic naval, and certainly found them too slow for a fleet action http://avonnapoleonicfellowship.blogspot.com.au/2014/11/battle-of-san-domingo-anf-me-recently.html. I will look out their fast play version, as well as Warm Work, which colleagues are test-playing in Perth, but after this good experience with GFA I for one will take quite some persuading to change rules.